The Alliance of GSP Countries (A-GSPC) was formed in 2011 to advocate for seamless renewal of the Generalized System of Preferences (GSP) program, prior to its expiration that year and, again, in July 2013, for as long as possible. The Alliance, for the first time, has given a voice to the beneficiary countries for which GSP is a critical part of their businesses’ access to the U.S. market. The Alliance is currently comprised of twenty-eight geographically and economically diverse countries. They are: Algeria, Bangladesh, Bolivia, Brazil, Cambodia, Ecuador, Egypt, Fiji, Georgia, India, Indonesia, Kazakhstan, the Kyrgyz Republic, Lebanon, Macedonia, Moldova, Mongolia, Nepal, Pakistan, Paraguay, the Philippines, Serbia, Sri Lanka, Thailand, Tunisia, Ukraine, Uruguay, and Yemen. The Alliance’s strength is in its numbers, which widens the organization’s reach and efficacy on the Hill. The Alliance functions through communications and meetings with its member-countries’ Trade Attachés, Commercial and Economic Counselors, pertinent Secretaries and, at times, Ambassadors. During the lapse in GSP, the Alliance worked effectively with Senior Trade Staff on the Hill and with other U.S. stakeholders to advocate for renewal of the GSP program. The Alliance issued press releases and sent letters to Members of the Senate Finance and House Ways and Means Trade Subcommittee to educate law makers on the impact of GSP on the beneficiary economies. The Alliance also worked closely with the U.S. importers’ group – the Coalition for GSP – to ensure effective coordination. Now that GSP has been renewed until the end of 2017, the Alliance’s focus has shifted to helping Member-country exporters benefit from GSP duty-free access to the U.S. market again and to re-establish commercial partnerships with U.S. importers. The Alliance holds meetings regularly to discuss issues that impact the trade competitiveness of Members’ businesses. 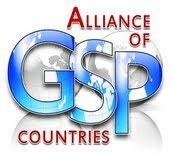 To join the Alliance of GSP Countries or for more information, please contact Tracy Simmons (tracysimmons@sandlertade.com) or Marideth Sandler (sandler@sandlertrade.com) or call 1.202.350.4303. For more information on GSP (click here). The 28 geographically and economically diverse nations of the Alliance of GSP Countries applauded legislation introduced recently in the U.S. Congress to renew the Generalized System of Preferences (GSP). Retroactive GSP renewal from July 31, 2013, through December 2017 is included in the AGOA Extension and Enhancement Act of 2015. The urgency to renew the GSP is summed up by the historic decrease of more than 17 percent in U.S. imports of GSP products during the first two months of 2015, as compared to a year earlier. U.S. imports of GSP-claimed items from individual Alliance countries declined by as much as 54 percent over the same period. GSP provides tangible opportunities especially to small- and medium-sized businesses in 122 beneficiary countries that comprise two-thirds of the world’s nations. It is extremely important that the legislation provides reimbursement to U.S. importers of the tariffs paid during the 20-month GSP suspension, the longest lapse in GSP’s 40-year history. However, there is no compensation possible for businesses in the GSP beneficiary countries that have lost hard-won U.S. market niches or, in many cases, been forced to reduce their prices to compensate for the tariff increases. The Alliance hopes that the proposed GSP extension through December 2017 will help these companies reestablish and expand their U.S. market linkages. The Alliance of GSP Countries includes the 28 nations of Algeria, Bangladesh, Bolivia, Brazil, Cambodia, Ecuador, Egypt, Fiji, Georgia, India, Indonesia, Kazakhstan, the Kyrgyz Republic, Lebanon, Macedonia, Moldova, Mongolia, Nepal, Pakistan, Paraguay, the Philippines, Serbia, Sri Lanka, Thailand, Tunisia, Ukraine, Uruguay, and Yemen. GSP benefits more than 3.8 billion people globally living in more countries than covered by any other U.S. trade preference program. When GSP is in operation, U.S. companies can import up to 5,000 products duty-free, such as raw materials, intermediary goods, and consumer-ready items. For more information on the Alliance and GSP, contact Tracy Simmons, Sandler Trade LLC, at tracysimmons@sandlertrade.com; or Marideth Sandler at sandler@sandlertrade.com or at 202.372.7999. The 22-member Alliance of GSP Countries has renewed its efforts to urge Members of Congress to reauthorize GSP as soon as possible. The Alliance greatly appreciates the bicameral, bipartisan effort put forward by House and Senate trade leadership to renew GSP prior to its expiration on July 31, 2013. Though unsuccessful, the efforts of the trade leadership point to GSP’s overwhelming popularity among Congress, U.S. businesses, and consumers. Time is of the essence; U.S. companies have paid $175 million in unanticipated duties just in the last three months. Suppliers are impacted, too. Of the 22 Alliance members, more than half have experienced significant decreases in U.S. imports under GSP. It is the smallest or most remote countries that have experienced the largest declines, including Mongolia (97.3%), Macedonia (56.7%), Fiji (23.1%), and Nepal (9.1%). The Alliance strongly urges Congress to double its efforts to renew the program as quickly as possible. It is time to reinstate duty-treatment of GSP-eligible products coming from developing countries – 70% of which are used as inputs for further manufacturing by U.S. companies. During the three months that GSP has not been in effect, imports from developing countries have dropped overall by 5.4%. Alliance countries’ small and medium-sized businesses are losing hard-won U.S. market niches to non-GSP low-cost producers. Prior periods of GSP expirations have shown that, even after retroactive renewal, U.S. import levels do not recover so many of these businesses do not survive. Examples of products that are facing high tariffs include telescopic sights from the Philippines (14.9%); fashion jewelry from Sri Lanka (11%), plywood from Indonesia (8%); building stone from Brazil (6.5%); pesticides from India (6.5%); and prepared foods from Thailand (6.4%). U.S. companies pay more than $2 million daily in unexpected duties. The bill grows larger and more costly every day GSP remains expired. U.S. businesses in California, New Jersey, and Texas have paid $16.2 million, $10.3 million, and $9.7 million, respectively, in the last two months. The geographically and economically diverse group of Alliance countries strongly urges the Senate to pass S.1331 and the House to pass HR 2709 to renew GSP as soon as possible. As of today, no clear path for renewal has been outlined by both parties. Businesses in the United States and abroad will continue to pay the price for that delay. Information on the Alliance and GSP is at www.allianceforgsp.org Media Contacts: Tracy Simmons, Sandler Trade LLC, at 202.350.4303 (tracysimmons@sandlertrade.com); and Marideth Sandler (sandler@sandlertrade.com) at 202.372.7999. The 20-member Alliance of GSP Countries expressed disappointment today with a dissenting Senator and Senate GSP supporters unable to find a compromise on offsets that would allow S. 1331 (GSP Renewal) to pass under unanimous consent before the program expires at midnight tonight. The Alliance has greatly appreciated the bicameral, bipartisan effort put forward by House and Senate trade leadership to renew GSP. Knowing that Congress has sometimes come to a halt to seek the perfect rather than the good, in the case of keeping U.S. companies competitive and aiding GSP countries through trade, unified GSP renewal effort has nearly resulted. The Alliance hopes that result can still occur before the August recess. In order to foster competitiveness and job-creation in U.S. companies that depend on GSP, and promote trade-driven economic development for beneficiary nations, Congress should strongly consider all of the cost-effective benefits derived from renovating GSP. GSP benefits more than 3.8 billion people living in two-thirds of the world’s economies. The GSP also strengthens the U.S. economy by generating tens of thousands of jobs and providing U.S. manufacturers with needed inputs. In 2012, alone, the GSP saved U.S. companies and consumers $750 million in duties on $20 billion of U.S. imports. Seamless GSP renewal is a priority for many American companies that keep competitive through importing raw materials, intermediary goods, and machinery duty-free. Companies, if GSP expires will pay $2 million daily in unanticipated duties. Non-renewal of GSP for Oklahoma, for example, will cost its companies $14,000 every day in unexpected duties. In 2012, Oklahoma’s businesses imported $120 million in goods, saving $5 million in duties. Top products imported by Oklahoma’s companies under GSP in 2012, much of them used in further manufacturing, were industrial and service machinery, chemicals, electric and electric-generating equipment, and motor vehicle parts. Previous experience shows that every time Congress allows GSP to lapse, GSP trade suffers for the long term. Retroactive renewal places financial strains on U.S. companies and causes the loss of hard-fought U.S. market niches for GSP’s exporters. Washington, DC – July 18, 2013 – The Alliance of GSP Countries strongly welcomes the introduction of HR 2709 by the bipartisan leadership of the House Ways and Means Committee and Trade Subcommittee. The bill would extend the Generalized System of Preferences (GSP) through September 2015. The Alliance fully concurs with and supports the bill’s intent that GSP renewal occur with no changes and that it be accomplished before the GSP expiration date of July 31, 2013. The Alliance now looks to the Senate to clear the necessary path so that bicameral passage of a clean GSP renewal bill will occur quickly. The Alliance is comprised of 18 economically and geographically diverse nations. Each time GSP lapses, even when renewed retroactively, GSP-eligible exports often made by small- and medium-size businesses in the 127 beneficiary developing countries, lose hard-won U.S. market niches. During the lapse of GSP in 2011, U.S. imports under GSP dropped by 17%, despite the 15% growth in overall U.S. imports. The fifteen nations of Algeria, Bangladesh, Ecuador, Fiji, Georgia, Indonesia, Moldova, Mongolia, Pakistan, Philippines, Sri Lanka, Thailand, Tunisia, Uruguay, and Yemen have formed the Alliance of GSP Countries to urge extension of duty-free treatment of U.S. imports from their countries. That duty-free treatment occurs under the Generalized System of Preferences (GSP), which expires on July 31, 2013 – in just 50 days. The Alliance seeks for Congress to renew the GSP quickly and for as long as possible. If not, the nations face adverse impacts to their economies and workers, and U.S. companies will pay $2 million daily in unexpected tariffs for essential raw materials and product inputs. The importance of the GSP cannot be underestimated. GSP benefits more than 3.8 billion people living in two-thirds of the world’s economies. The GSP also strengthens the U.S. economy by generating tens of thousands of jobs and providing U.S. manufacturers with needed inputs. In 2012, alone, the GSP saved U.S. companies and consumers $750 million in duties on $20 billion of U.S. imports. Seamless GSP renewal is a priority for many American companies that keep competitive through importing raw materials, intermediary goods, and machinery duty-free. Media Contacts: Tracy Simmons, Sandler Trade LLC, at 202.350.4303 (yrouai@sandlertrade.com); and Marideth Sandler (sandler@sandlertrade.com) at 202.372.7999. Sandler Trade LLC and the Royal Thai Embassy’s Commercial Office Launch GSP Beneficiary Countries Advocacy for Prompt GSP Renewal – The Clock is Ticking! Washington, D.C. – On April 17th, the Royal Thai embassy hosted an organizational session for a newly formed Alliance of GSP Countries (A-GSPC). The meeting was facilitated by Sandler Trade LLC and enthusiastically received by over twenty participating GSP beneficiary countries. The U.S. Generalized System of Preferences (GSP) program, which provides duty-free treatment for imports of certain products from qualified developing countries, will expire on July 31 unless renewed by the U.S. Congress. The nations represented so far in the Alliance of GSP Countries account for more than 1 billion people and account for 40 percent of GSP imports annually! The Alliance membership is growing. GSP beneficiary countries experienced the negative and disruptive impact on their GSP product exports and producers, many of whom are small and family-owned businesses, when the GSP program last expired in 2011 and lapsed for 10 months before being renewed with retroactive effect. U.S. importers and manufacturing companies that rely on duty-free inputs imported under the GSP program were also negatively impacted by the disruption. Even though a retroactive refund of duties was possible after the program’s eventual renewal, many businesses were not equipped to make retroactive refund claims, causing lasting damage. At the initial meeting of the A-GSPC, Sandler Trade LLC provided information that shows that every time the GSP program expires, and the longer the expiration, the more erosive the impact on GSP trade. As shown in the table below, GSP imports fell or stagnated during periods of program expiration and short-term renewal. Imports grew steadily between 2002 and 2006 when the program was renewed for a four-year period. Disruptions in GSP treatment can have devastating effects on small business employment and development goals in beneficiary countries. The impact on the U.S. economy is also severely disruptive. On average, U.S. businesses that export rely on imported products for 40 percent of their inputs. If the cost for these inputs rises due to tariff increases, these businesses are less competitive in the global marketplace. The A-GSPC will do its utmost to inform members of Congress of the benefits of the GSP program for the U.S. economy and for the development and poverty reduction goals of GSP beneficiary countries. It will seek to educate members of Congress, using real-world examples, about the damaging consequences on trading patterns, companies and lives, of allowing the GSP program to lapse, even if only temporarily. Traders and producers need certainty! The A-GSPC will urge that the Congress act quickly to renew GSP before it expires and that it allow GSP to remain in place without interruption for an extended period of time. This will benefit the U.S. economy and help meet the objectives of the GSP program. A-GSPC will work with the “Coalition for GSP”, a group of American companies and associations that benefit from GSP and is also seeking prompt renewal of the program. Congressional authorization of the GSP is due to expire on July 31, 2013 – just 74 days from today. The GSP promotes tangible economic growth for 127 eligible countries, for 3,511 products. Each of the 44 Least Developed GSP beneficiary countries may export an additional 1,464 products into the U.S. market duty-free. $19.9 billion worth of products were imported into the United States in 2012 under GSP. U.S. companies and consumers saved $750 million in duties thanks to the GSP program. Approximately 82,000 jobs are directly linked to GSP in the United States. GSP benefits more than 4 billion people living in two-thirds of the world’s economies. Sandler Trade LLC is excited and honored to be part of this important initiative!